Why should I buy Music Writer Touch? We knew we were on the right track when we had middle school kids come up to our booth at conventions and dive right in to the program, all without any explanation or instruction. Music Writer Touch boasts a user-friendly interface with a simple, yet intuitive design. No searching for functions, while keeping your work space clutter free at the same time. Non-invasive help functions will point you in the right direction should you ever need guidance. Literally everything you need, right at your fingertips. Many students are already accustomed to touch screens, whether it’s from mobile phones, tablet, or desktop computers. They’ll feel right at home when called on to demonstrate exercises on the Interactive Whiteboard. No touch screen – no problem. Notation is just as easy with a standard computer keyboard and mouse. The Music Educator. The aspiring college graduate. The enthusiastic student. We know why you do it. The excitement from watching your students succeed. Nailing that last phrase in your recital. The desire to learn. The passion for music. We know you love it, even though getting to the end result can sometimes be stressful. Waking up early and getting home late. That big theory test. Sweating out summer band, to holiday concerts that no one except the parents are excited about, to waiting for those solo & ensemble results to be posted. You have enough on your plate already. You shouldn't have to worry about navigating through clumsy notation software. That's why we have developed the most intuitive notation software to date. 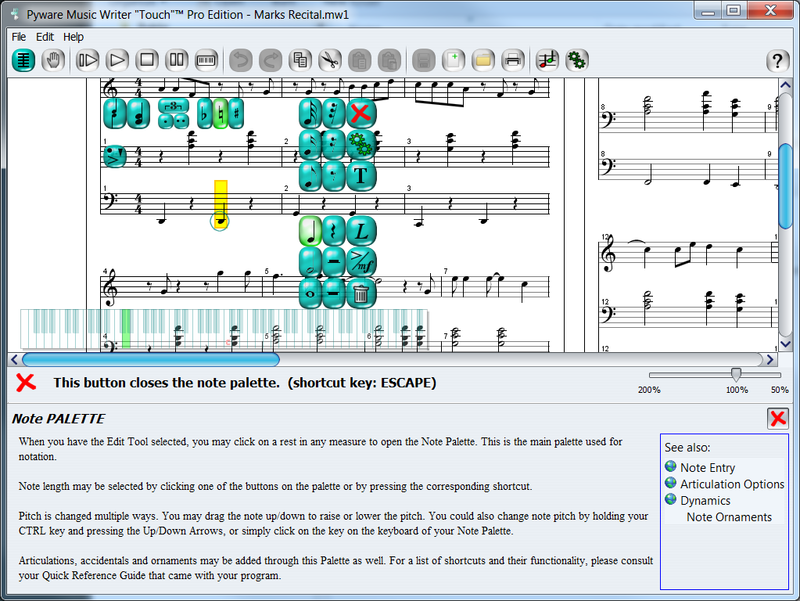 Introducing Music Writer Touch (MWT), the easiest to use music notation software available. Pygraphics, Inc. has been providing you with the tools for success for almost 30 years. In 2010, we want to empower you with the most unique and efficient notation program ever. Once again, we bring you an interactive software that makes both education and learning FUN. Music Writer Touch is 100% compatible with "touch screen" technology. Whether you have a keyboard and mouse or a touch screen monitor or interactive Whiteboard, you will be able to easily develop music and scores that can be saved as working files or exported as a MIDI sound file. We have developed Music Writer Touch for you. The educator. The musician. The student. Enjoy. What is Music Writer Touch? 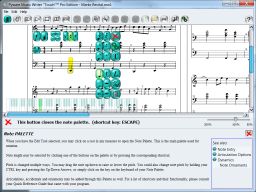 Music Writer Touch (MWT) is a music notation software developed for use with touch screen monitors and interactive whiteboards. While the program is not limited to only these types of note entry (you can still use your keyboard and mouse! ), we aim to have the program run fluidly on interactive displays, providing both teachers and students a new and exciting avenue for music development. MWT is intended for use by teachers and students just starting band/orchestra through high school level music education. To read about the features of Music Writer Touch, please visit the features page. Want to take Music Writer Touch for a test drive? Download the free demo today! You can find the installer on the demo download page. Once you have tried the demo, be sure to let us know what you think by using our feedback form. Copyright © 2012 Pygraphics, Inc.